The Obelisk is a 1984 Masters of the Universe mini-comic written by Karen Sargentich and illustrated by Alfredo Alcala. Here, a mysterious obelisk with magical powers appears, and everybody fights over it. This is the first of the fourth series of mini-comics (or the last of the third, depending on what account you go by), and honestly it doesn’t get off to the best start. Holy smokes, the dialogue is bad. It’s corny, expository, and where are the commas? 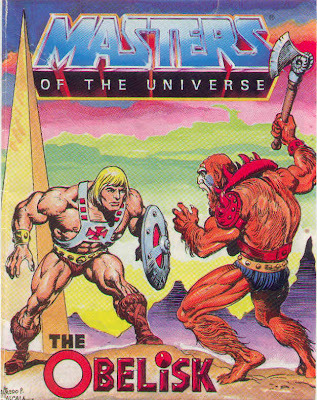 The story isn’t a lot better, and the ending, where He-Man and Skeletor spam the obelisk for minions until they break it, is pretty lame. This is, alas, the last of the Alcala mini-comics. His art and colors are great as always, even if he has lowered himself to use goofy poses that fit the goofy story. It’s funny, though, to see the Evil Warriors gathered around tiny Muppet-headed Snake Mountain (they sure as heck won’t fit inside). All it’s missing is a campfire. Alcala’s art is the only reason to read this one – but it’s a good reason.